If you are resident in Corfu or are a visitor to this beautiful Greek island and would like to worship in an English speaking church you will find a warm welcome at the Anglican Church of Holy Trinity Corfu. We are an Anglican Chaplaincy within the Church of England Diocese in Europe, and we welcome Christians of all denominations and those who would like to find out more about the Christian faith. 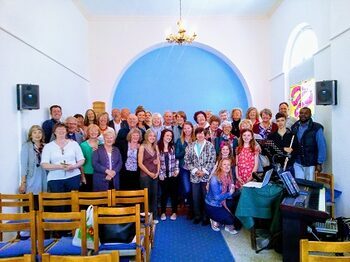 We have a vibrant resident congregation originating from a variety of different parts of the world and during the summer months we enjoy welcoming the many visitors who join us for worship on Sunday and may also appreciate week-day events that we host in the Church Room which also holds our extensive lending library. The weekly programme is varied, including times of Bible Study, Fellowship & Prayer, Monthly Wednesday Lunch 'n' Meet, & Tuesday Coffee Mornings in the Church Room, Friday Mums & Tots group, amongst many other activities.